Already a while ago, we heard that the Pope would consecrate the world to the Immaculate Heart of Mary this October 8. I write this article in September and its purpose is not to predict the Pope’s actions in October (I am not a prophet), but to outline the conditions necessary for a consecration correspondent to Our Lady’s requests and the possibilities of what may happen. Several facts that will have to be mentioned have been amply discussed in past issues of The Fatima Crusader and I will — consequently — try to avoid unnecessary repetitions. I write this article in my quality as a theologian and canonist, but, in all frankness, I have to underline the fact that, the message of Fatima being one of the clearest ever, for many of my conclusions no academic knowledge of theology is required, but simply our God-given common sense, which — according to G.K. Chesterton — was the method of St. Thomas Aquinas. It really needs little more than common sense to be able to see through the Vatican’s impertinent and often rather silly lies and schemes in their plot to silence Our Lady. I waste little time and space here with an eventual discussion about the authenticity of Our Lady’s request, even though this has been challenged only recently by someone who stated that only the 1917 events had received an approval by the Church, not the events after that. The absurdity of this statement can easily be seen by a closer look at the fact that no Pope, after 1929, even remotely hinted at the possibility that the events after 1917 would be anything but authentic. Such suspicions also show very little respect for Our Lady: Sister Lucy herself confirmed the events after 1917 repeatedly. Either they are authentic or she is mentally incapacitated or even a liar in which case the question arises why Our Lady would not have been informed by God about this aspect of the future…. As a consecration has to be specific, it also has to be individual. At baptism, which is the first consecration of a Christian, the child has to be baptized individually. Even in the old days when missionaries still had a lot of conversions to deal with (instead of praising the “merits” of other religions), it would not suffice to baptize a village! It was not even sufficient to baptize each individual, but he had to be given a name. The same is true at Confirmation, where we receive another name. Marriage is invalid if one of the two is in error about the identity of the other. At Ordination each single candidate is presented by name just as in the case of Aaron. Antiquity believed in the importance of names. They were not that much concerned whether the “seat of the soul” was the heart, the brain, or the left kidney, but they were concerned about the name: An individual’s name — in a way, according to the ancients — WAS his soul. When ancient Egypt decided to eliminate one’s name, it was worse than death: After Pharao Amenophis IV. (Amenhotep IV., 1352-1336 B.C.) decided to change Egypt’s system of worship, he changed his name from “Amenhotep” (= Amun is content) to Echnaton (Akhenaten = Aten is Life, or: Glory of the Sundisc) to signify the change in his soul. When he had died and Egypt had returned to its old system, his mummy disappeared together with his name, for to eliminate one’s name was to eliminate the person. Sacred Scripture underlines the importance of names and so does Christ: When Simon, the son of Jonas, becomes His Vicar, his name changed to Kephas, Petrus, the Rock upon which the Church is built (Cf. Matt. 16:17 ff.). The Church celebrates the most Holy Name of Jesus (Jan 2, or the Sunday before Epiphany) and the Most Holy name of Mary (Sept. 12) that commemorates Our Lady’s victory against the Turks in 1683. The name Israel means: Fighter for God. The country’s name is sacred! To the Catholic, Rome means (or meant) the Holy City and the name “Roma” means a lot more than a noisy bustling conglomerate of houses and streets full of Italians. Finally we have to remember that Our Lady mentioned Portugal’s Guardian Angel! This shows us clearly that a country — however flexible its political boundaries might be — can be considered an individual. Switzerland is a country of four established languages — without the local dialects — and yet a definite individual. “Many times the Blessed Virgin Mary told me and my cousins, Jacinta and Francisco, that Russia is the instrument of chastisement chosen by Heaven to punish the whole world (for its sins) if we do not beforehand obtain the conversion of that poor nation” (See The Fatima Crusader Issue 63). It must also be noted that Our Lady explicitly named “Russia” when its official name was: SSSR (Sojuz Sovietskikh Sotsialistitsheskikh Respublik = Union of the Socialist Council -Republics), obviously in reference to the name of the country, not the communist oppression of (officially) 22 republics. No individual can judge or command the Pope, but that does not mean that he would have no further obligation to obey Christ, tradition, Christ’s manifest Will — and common sense…. With all due respect, it has to be pointed out that the Pope is not the Head of the Church, but His vicar on earth. He is not the president, but the vice-president. There can be no doubt about the words “in union with him and at the same time,” except for the detailed question of the time: That it would have to be on the same day – say Sunday, October 8 of the year 2000, the last of the century – cannot be doubted. … bishops are the successors of the apostles by divine institution, they are constituted pastors within the Church, so that they are teachers of doctrine, priests of sacred worship and ministers of governance (can. 375, § 1). By the fact of their episcopal consecration bishops receive along with the function of sanctifying also the functions of teaching and of ruling… (can. 375, § 2). Bishops are called diocesan when the care of a diocese has been entrusted to them; all others are called titular (can. 376). Canon 375, in its second paragraph, is somewhat misleading as to the power of “ruling,” received “by the fact of their episcopal consecration.” This is impossible. According to can. 382, § 1, a bishop “cannot exercise the office entrusted to him unless he has first taken canonical possession of the diocese.” Titular bishops, whose “diocese” is usually a heap of rubble in the Sahara, or similar, “by the fact of their consecration” enjoy no “function of ruling” except, according to canon 967, § 1, the faculty of hearing Confession universally, a faculty that can be limited according to the same canon. Any Vicar General has more jurisdiction by virtue of the law than a titular bishop (cf. cc. 475 ff.). According to can. 329, the bishop governs a particular church (ecclesia pecularia), while can. 348 denies jurisdiction to the titular bishop. The other relevant canons (cc. 329; 350-355; 948 ff.) mention no power of ruling either. Are titular bishops, then, no real bishops? In the sacramental sense, they are bishops most definitely, but as to their jurisdiction, they are not bishops in the proper sense of the linguistic usage: “the bishop OF his diocese.” They are but auxiliaries IN the jurisdiction of the bishop OF the diocese. The Pope enjoys the primacy not only in matters of faith and morals, but also discipline and government of the Church (DS 3060, can. 331). According to can. 333, § 1, (1983) this power extends “over all particular churches and groupings of churches” and he has the “right, according to needs of the Church, to determine the manner either personal or collegial, of exercising this function” (can. 333, § 2). There is neither appeal nor recourse against a decision or decree of the Roman Pontiff” (can. 333, § 3). All bishops, even diocesan, are subject to this authority, if reserved (cf. can. 381). “The Church has an innate and proper right to coerce members of the Christian faithful by means of penal sanctions” (can. 1311). The Supreme legislator and judge in the Church can order bishops by a decree threatening the automatic penalty “against certain particularly treacherous offenses which either can result in more serious scandal or cannot be effectively punished by means of inflicted penalties” (can. 1318). If a bishop culpably (can. 1321) ignores “legitimate precepts … of the Apostolic See” (can. 1371) AND threat, the “just penalty” (can. 1371) could even be more severe (can. 1326). In clear words: The Pope can, may, and must order the bishops to join in the consecration, and threaten them with a just penalty, e.g. suspension from their office for the case of non-compliance. 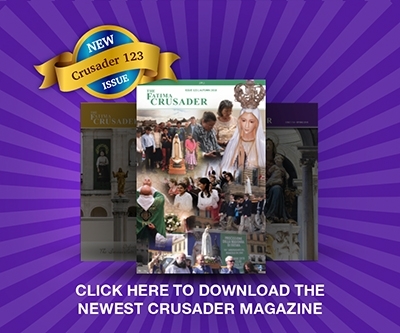 Only in this case would the request of Our Lady be fulfilled: Sister Lucy mentioned that “many bishops attached no importance to this act” (See The Fatima Crusader Issue 64). They WILL attach importance to this act, if threatened with losing their position, job, honors, incomes, and comforts, if they are not interested in the fate of their souls. Only in this case ALL bishops would have joined in the consecration as the ones who did not cease to be bishops. (This is another indication that — probably — only local ordinaries are meant by the words of Our Lady, because their office can be taken away, never their consecration). When I consider that Father Gruner has been threatened with excommunication for preaching Our Lady’s message and for pursuing his canonically granted rights, I believe the above mentioned penalty of suspension to be too lenient, it might serve the practical purpose, however. 4. HAVE OUR LADY’S REQUESTS BEEN FULFILLED SO FAR? This answers the question sufficiently and — alas — in the negative. FIRST and foremost (! ), we should not even discuss Fatima if — through negligence — we have not yet done the Five First Saturdays of Reparation. SECOND, we might as well do the Five First Saturdays a second (or one more) time — (a) to please Our Lady, (b) for safety’s sake. SEVENTH, we should willingly and actively support those who preach and set forth Our Lady’s message.